The X-Wing miniatures game is very, very good. If there's a complaint I have about it, though, it's that there isn't a campaign mode for more long-term play and... oh, wait, thanks to a very dedicated fan, now there is. Wonderful. First released in 2015, and created by Josh Derksen, Heroes of the Aturi Cluster is a massive expansion for Fantasy Flight's X-Wing miniatures game that basically transforms the experience, replacing short adversarial skirmish battles with a lengthy RPG-like co-op campaign. Derksen says it's "more than a fanmade campaign PDF- It's practically a boxed-boardgame full conversion for X-wing! ", and he's not wrong. 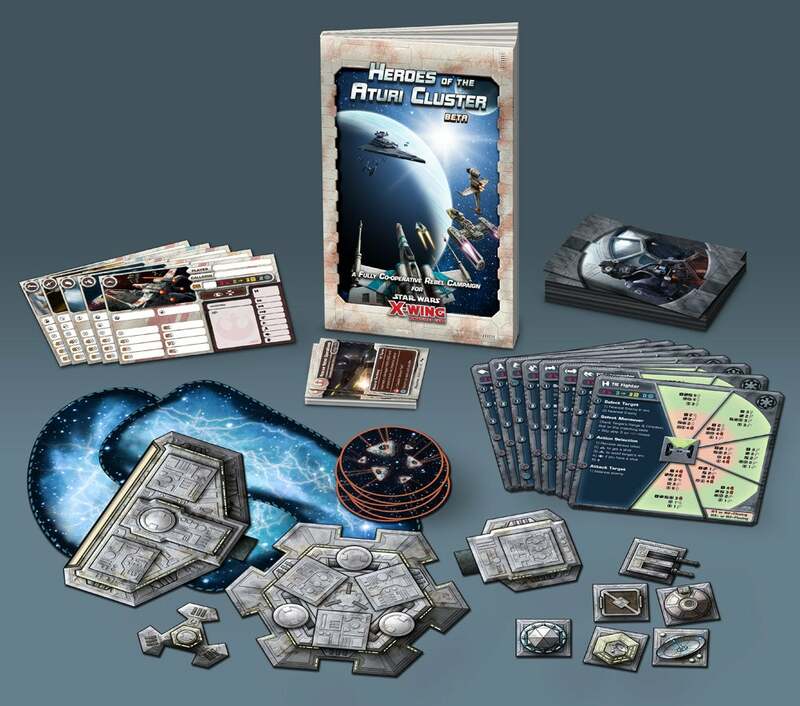 Designed for up to six players (but playable solo), it pits a Rebel squad against an Imperial AI over a number of sequential missions while also adding a large colour campaign book, player scoresheets, a mission deck, an Imperial pilot deck, Imperial AI deck and new terrain, with things like minefields, a nebula and even a modular space station. Being fan-made it is of course free, but perhaps the best part is that the art on everything is fantastic, matching perfectly with Fantasy Flight's style in the actual commercial game. The only catch, of course, is that it's not really free, since you need to head to professional printers to get all the books and cards and terrain printed up if, like me, you have gaming OCD and you need everything to match up in terms of quality with the official X-Wing stuff. If you play X-Wing and want to try it out (remember, you can play solo, you don't need a crew), you can download the necessary image files and rulebooks here.